Today there are 12,092 fans on this Facebook page. 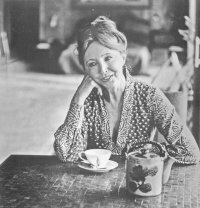 And what an easy way to get involved with Anaïs Nin fans (or ninnies as my skeptical pal William Rossa Cole used to call those who he considered fans of her work) since he brought me to meet Frances Steloff at Gotham Book Mart, how irritated could I get by his little jab/jest. The contact person for the site is Corina Joy. You can reach her by email by signing up as a fan for the site or reading the Wall. To distinguish her page from others on Facebook, look for this picture of Nin (which I haven’t seen in this format with the teapot). I still prefer to think of her drinking coffee! Being a tall Americano myself and my love of this quote of Anaïs which we use on our ordering page on AnaïsNin.org for my favorite book on Anaïs, Benjamin Franklin’s Recollections of Anaïs Nin by her Contemporaries. One of those out of print gems that you should search for on ABE.com you can buy a copy today for $3 or click on Amazon’s link to ask for it to be added to the Kindle bookstore!